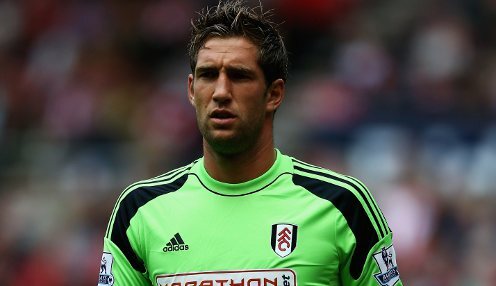 Ronald Koeman has continued to strengthen his Southampton squad by snapping up the Fulham goalkeeper Maarten Stekelenburg on a season-long loan. The 32-year-old Dutch shot-stopper moves to St Mary's because Koeman will be without the services of Fraser Forster at the beginning of the 2015/16 campaign as the England goalkeeper continues his recovery from a long-term knee injury. Stekelenburg spent last season on loan at Monaco, but only made seven appearances for the Ligue 1 side, who decided not to exercise their option to sign him on a permanent basis. Maarten is a goalkeeper with a wealth of top-level experience. The former Ajax goalkeeper moved to Roma in 2011 before agreeing a four-year deal with Fulham in 2013. He has won 54 caps for his country and was an ever-present in the Netherlands side that reached the World Cup final in 2010, but he has fallen out of favour at Craven Cottage. Southampton's executive director of football of Les Reed said: "Maarten is a goalkeeper with a wealth of top-level experience who will prove to be an important addition to the squad at this early stage of pre-season. Southampton can be backed at 1/1 to finish in the top half of the table next season and are 1/1 to secure a top-four finish, while they are available at 1/1 to win the Europa League.